Hennessy winner Many Clouds followed up his Newbury triumph with victory in the Betbright Cup at Cheltenham on Festival Trials Day. The 4-1 chance, ridden by Leighton Aspell for Oliver Sherwood, beat the greys Smad Place and Dynaste. Many Clouds, who won by one-and-a-quarter lengths and a neck, is as low as 8-1 (from 14s) for March's Gold Cup. Aspell, 38, once retired but came back and won the 2014 Grand National on Pineau De Re. 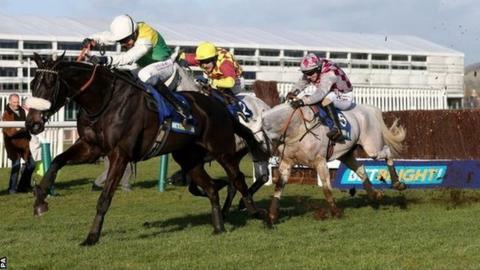 Trainer Sherwood is also having a renaissance and enjoyed his first winner at Cheltenham for 15 years. "It's great to have that monkey off my back," said Sherwood, who has claimed six victories at the Festival itself. "The dream is still alive. My job now is to get him back here in one piece for March." David Pipe indicated the preferred target for Dynaste remained the Ryanair Chase, which he won at the 2014 Festival. Smad Place was receiving an 8lb weight allowance from the winner, but trainer Alan King said he was likely to go up against him again in the Gold Cup on 13 March. "This success by Many Clouds was more authoritative than the one-and-a-quarter length and neck distances perhaps indicate, and makes him a serious player in the Gold Cup picture. "I loved the manner in which both Dynaste, a 'proper' horse who was runner-up in the King George, and Smad Place, meeting the winner on miles more favourable weight terms than when fifth behind him in the Hennessy, served it up late on, but were comfortably seen off. They got close, but were never ever going to get by."